Get your tickets now before the show is sold-out! Al-Madinah Cultural Center presents to you our annual Comedy Night. 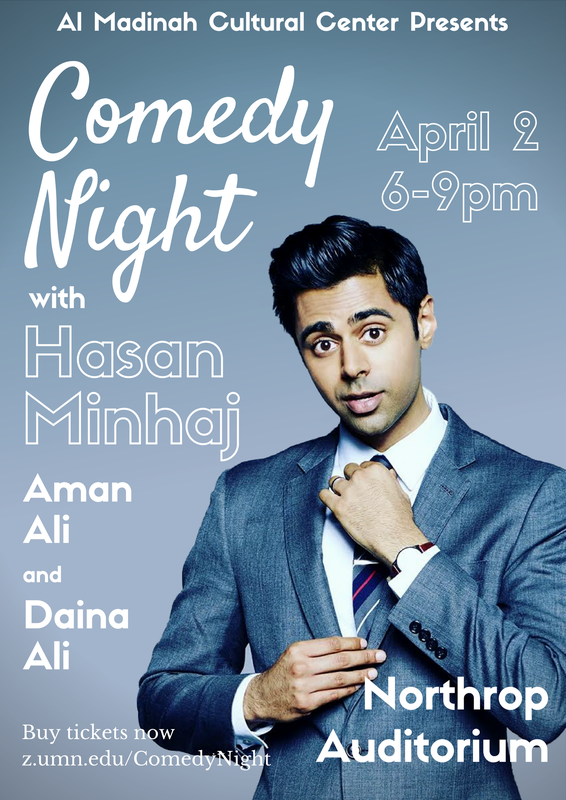 We are excited to announce our headliner for the night will be the Daily Show Correspondent, Hasan Minhaj, with opening acts from Aman Ali and Daina Ali. Our event this year will be taking place at Northrop on the Carlson Family Stage on Sunday, April 2nd from 6 – 10 pm. It is our great honor to be able to bring you an amazing show. Enjoy a night full of laughs with great comedians and even better company. Visit https://amccumn.com/comedy-night/ for more information. Next Islam Awareness Week needs dedicated volunteers!